Villa de playa totalmente equipada en la costa este de Zanzíbar, en el pequeño pueblo de pescadores de Jambiani. 120 € por día por habitación. 250-350 € por día para toda la villa. 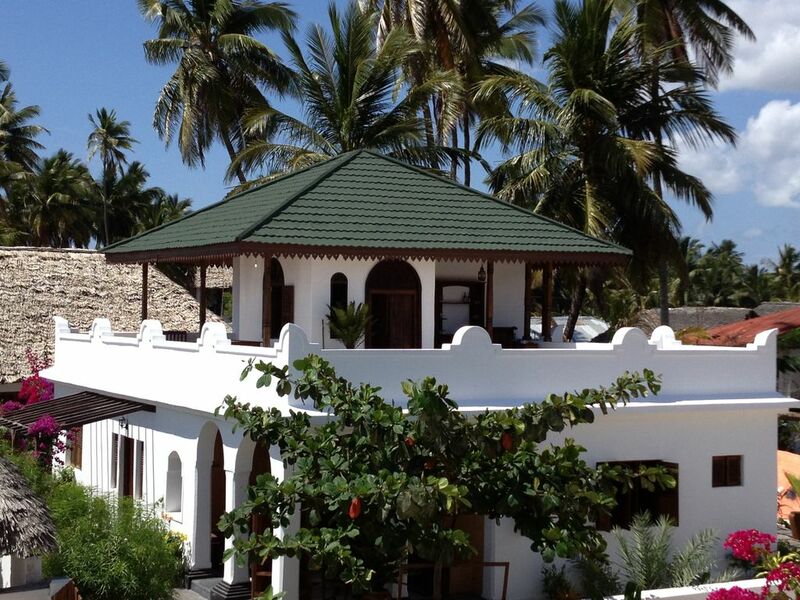 'Mwendawima Villa' es para viajeros a los que no les gustan los paquetes turísticos con todo incluido, los complejos llenos de gente pero que desean que sus vacaciones sean auténticas en un área aún intacta. 'Mwendawima Villa' se encuentra directamente en una playa de arena blanca, nade en la laguna azul incluso con marea baja, hermosos paseos al arrecife, navegue en la laguna en un barco de pesca tradicional, cerca de muchos bares de playa y restaurantes, kitesurf justo enfrente del Villa, escuelas de kitesurf e instructores a 5 minutos a pie. 4 habitaciones dobles, 3 baños, cocina, bar en casa, gimnasio (pesas, barra para levantarse, colchonetas de yoga, etc.) 3 salas de estar, una gran terraza con vista a la laguna azul. Villa de segunda línea con vistas laterales al mar. A 10 metros de la playa. Fantastic stay, a place to get away from it all. We stayed for 12 nights in January 2019 and rented to whole property. The house could not be closer to the beach, right on the doorstep, the bedrooms are comfortable and equipped with both ceiling fans and portable fans and there's was plenty of space for our 7 person party. We enjoyed the roof terrance and it was fabulous to eat breakfast overlooking the clear blue ocean, the view is amazing. There are plenty of beach bars and restaraunts within walking distance along the beach, and a few shops for supplies in Page. Most evenings we chose to eat at the property as Mohammed and his team were absolutely fantastic, I cannot shower enough praise on them, the food was wonderful and they even made me a birthday cake one evening. The staff were so friendly and welcoming we were really sad to leave them, Rapael was also great and was quick to answer any queries prior to our visit and contacted us whilst we were there just to check everything was going well, Kim the house manager was on hand to organise any trios or transport we needed, all in all we had a lovely memorable holiday and would recommend this property to anyone travelling to Zanzibar. Vi har haft en underbar vistelse i Zanzibar. Mwendawima villa är ett underbart hus med plats för många. Vi blev så väl bemötta av alla när vi kom. Kim som ordnade skjuts åt oss närhelst vi ville se delar av ön men framförallt till vår trevlige kock Mohammed och hans team. Det var inga problem att laga högklassiga 3- rätters middagar till oss varje kväll trots att vår ena dotter är glutenintollerant/ celiaki. Vi hade med oss hennes mjöl, pasta och bröd men han fixade hennes pannkakor till frukost och samma mat till henne som alla andra i följet på kvällen. Det betydde så mycket för oss alla att Mohammed inte såg glutenintolerans som ett problem utan allt var lösbart. Vi hade printat ut kort från Celiakiförbundet på swahili som han fick av oss. Vi kan bara rekommendera "Mwendawima villa" till alla och kan varmt rekommendera att även anlita Mohammed under er vistelse. We can highly recomend Mwengawima Villa. You should absolutely let the chef Mohammed make your dinner in the evening. It tasted so good every evening, delicious food. Our daughter have celiaki and can't eat the same food as the rest, but it was no problem for Mohammed. The villa was perfect for our week-long stay in Jambiani. Muhammed, Said and the ladies were ever-attentive. The fenced yard was great for our puppy who enjoyed all the new smells! Beds were comfy, views from the rooftop veranda fabulous and location can't be beat! The property was gorgeous, clean and very well maintained. The staff was incredible except for the property manager who really did not do anything. The staff was great and the meals they made were delicious. Beach was awesome. Regarding the communication I told you as soon as you booked that this was a reduced price on a sharing basis (B&B), the top bedroom already rented, and that the whole house would have been a lot more expensive. You agreed to it and it was never an issue. Our conversation is recorded in the message history. We were a family of 8, including 2 children (8 and 10) starting our vacation in Zanzibar. Raphael was very responsive, answering all my questions before arriving at Mwendawima Villa. Kim's brother Kamaka greeted us at the airport and also did the transports to our snorkelling and back to Stone Town which was very easy, friendly and worry free. The villa was so comfortable for us to relax and enjoy being a family after a very long flight from Canada. Every night I watched the stars from the top terrace with my grandchildren. We were totally spoiled with the meals prepared by Mohammed (weeks later and I am still thinking of them!). All of the staff were wonderful ....such a treat to have our laundry done and beds beautifully made up each day. The easy and safe beach was so great, the kids could head down by themselves so it was very relaxing for everyone. The colours are so beautiful and the waters very interesting and warm. I was glad that one review mentioned bringing water shoes as we appreciated bringing ours. We loved the top patio and enjoyed all our meals there. Did I mention the breakfasts? ...or the samosas'.....? Fabulous! A truly memorable time. Too bad it is so far for us to travel as we would all love to return. This is a wonderful villa at Jambiani. The is a great team who cook delicious meals catering to every taste. The villa is cool and breezy with many places to sit and relax. Con todos los servicios villa de playa en la costa este de Zanzíbar, en el pequeño pueblo pesquero de Jambiani. 4 habitaciones dobles, 3 baños, bar privado, 3 salas de estar, gran terraza sobre la laguna azul, kitesurf. Cerca de bares y restaurantes de playa. La villa se terminó recientemente en julio de 2013 y situado directamente en una playa de arena blanca fabulosa. Dispone de 4 habitaciones dobles, 3 baños, un bar privado y 3 salas de estar. La gran terraza cubierta con vistas a la laguna azul. El equipo de gestión le ayudará cuando sea necesario. El equipo vendrá y te recogen en el aeropuerto. Posibilidad de alquilar su propio coche. Posibilidad de grupo más grande de alojarse en los bungalows adyacentes. Indicative price: €320 per day for the whole villa 4 double bedrooms, 3 bathrooms, private bar, 3 lounge areas, large roof terrace over the blue lagoon, kitesurf. Direct on white sandy beach. Close to beach bars and restaurants.